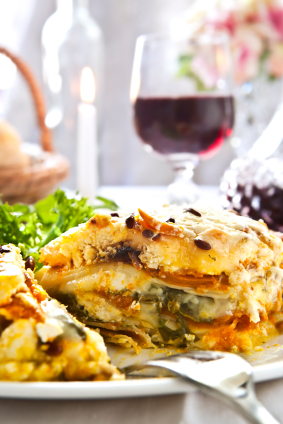 Lasagna is a very nutritious and versatile dish. This vegetarian one is filling, very quick to make and the recipe can be varied according to the vegetables that you have on hand. It also freezes well and the flavour improves overnight with refrigeration so if you do happen to have any leftovers you can be sure that they won’t last for long. Into a medium-sized pan add the onion, capsicum, garlic and oil and cook lightly. Add the tomatoes, stock and taco sauce. Cook on a low heat for 2-3 minutes. Take an oven proof oblong baking dish. Spread some tomato sauce over the bottom of the dish. Cover the sauce with a layer of pasta sheets. Cover the pasta with 1cm thickness of spinach and walnuts and sprinkle with nutmeg. Arrange the sliced pumpkin on top of the spinach layer. Cover the pumpkin with another layer of lasagna. Then top this with the remaining tomato sauce followed by the ricotta or cottage cheese. Sprinkle over the parmesan cheese and Italian herbs. Cover with tin foil and bake at 180°C for 1 hour. Remove the foil, sprinkle with the grated Edam cheese and return to the oven uncovered for a further 5 minutes. Serve with salad and fresh bread. Each serving contains: Energy 1495kJ/356 kcals; Prot 19g; Fat 20g; Carbohydrate 25g; Dietary fibre 5g; Sodium 340mgs. Variations: Suitable vegetables to include would be mushrooms, courgettes, corn, peppers, eggplant or kumara. Beans and lentils can also be added for extra protein if so desired.